Empty 4 cans of tuna into a large strainer over the sink, and let them drain while you prepare the following ingredients. Sauté onions in olive oil for about 8 minutes in a sauté pan, until translucent. Set aside and let cool. While the onions are cooking, in a large mixing bowl, add Greek yogurt, lemon juice, salt and pepper and whisk till combined. Then add cilantro and peppers to the mixture. Add the tuna, beaten eggs, cooked onions and almond meal, and mix gently. Using a 1 1/2 inch scoop (or your hands), form the mixture into balls and place on a parchment-lined baking sheet. 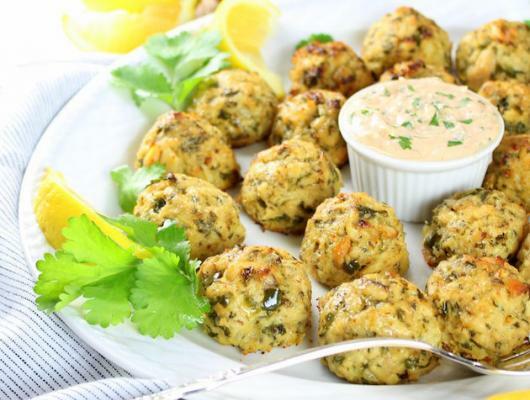 If you are freezing the tuna cakes, leave them on the baking sheet and place them in the freezer. Once firm, store them in a re-sealable freezer bag until needed. To finish the cakes, bake on 425 for about 20 minutes, just until they start to crisp and become golden. Combine all ingredients in a small mixing bowl, and whisk thoroughly. Adjust salt and pepper to taste. 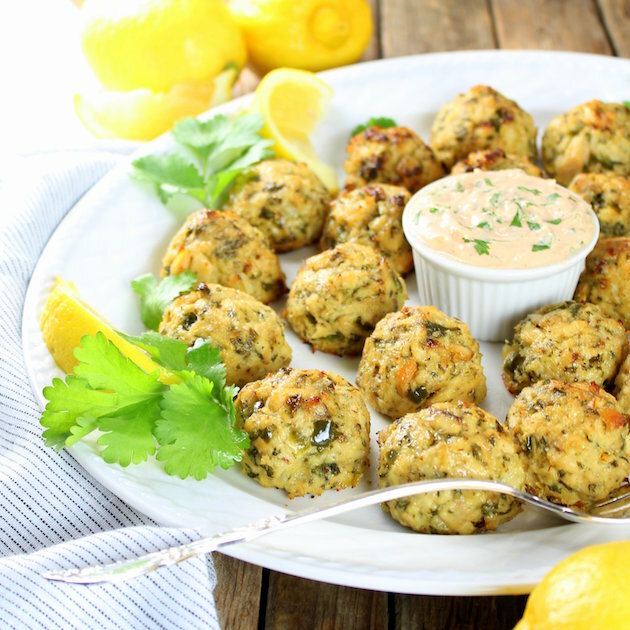 Healthy Tuna Cakes with Spicy Lemon Yogurt Sauce: Low-carb, low fat, high-protein and absolutely delicious! Ready in less than 30 minutes.